LONDON, Wednesday 3 June 2015: The 59th BFI London Film Festival in partnership with American Express® is delighted to announce that this year’s Opening Night film will be SUFFRAGETTE, the first feature film to tell the story of the ordinary British women at the turn of the last century who risked everything in the fight for equality and the right to vote. The film will receive its European premiere on Wednesday 7 October at the Odeon Leicester Square, attended by the filmmakers and stellar cast (including Carey Mulligan, Helena Bonham Carter and Meryl Streep), with a live cinecast from the red carpet and simultaneous screenings taking place at cinemas across the UK. The film stars Carey Mulligan, Helena Bonham Carter, Brendan Gleeson, Anne-Marie Duff, Ben Whishaw and Meryl Streep. It is directed by LFF alumna Sarah Gavron, who returns to the Festival for a third time, reteaming with her Brick Lane screenwriter Abi Morgan (The Iron Lady). SUFFRAGETTE is produced by Faye Ward and Alison Owen (Saving Mr. Banks, LFF Closing Night film, 2013). SUFFRAGETTE is an intense drama that tracks the story of the foot soldiers of the early feminist movement as they fought for the right to vote, women who were forced underground to pursue a dangerous game of cat-and-mouse with an increasingly brutal State. These women were not primarily from the genteel educated classes, they were working women who had seen peaceful protest achieve nothing. Radicalised and turning to violence as the only route to change, they were willing to lose everything in their fight for equality - their jobs, their homes, their children and their lives. 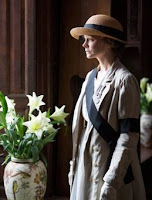 The character of Maud, played by Carey Mulligan, is one such foot soldier. The story of her fight for dignity is both heart-breaking and inspirational. The film is produced by Ruby Films for Pathé, Film4 and the BFI in association with Redgill Productions and with the participation of Canal+ and Cine-Cinema. Executive Producers are Cameron McCracken, Tessa Ross, Rose Garnett, Nik Bower, James Schamus and Teresa Moneo. Christopher Collins was the lead executive for the BFI. Pathé UK release the film in cinemas nationwide on 30 October, 2015.